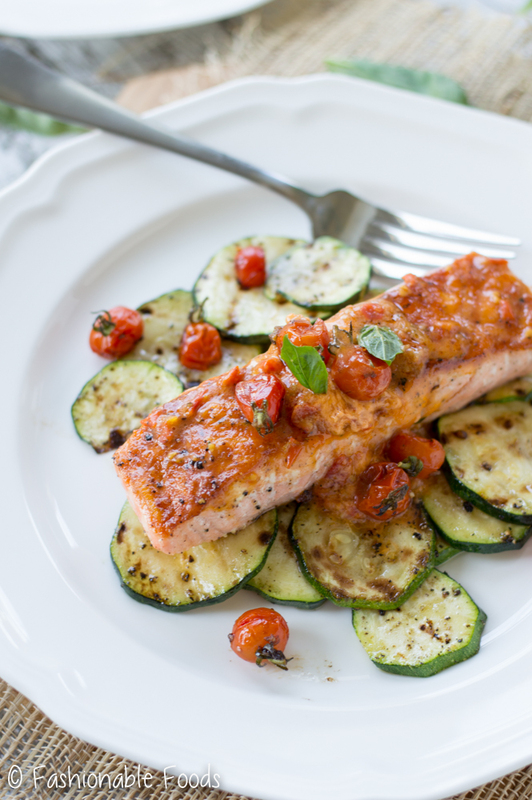 Hang on to summer just a little longer with this tasty salmon dish! 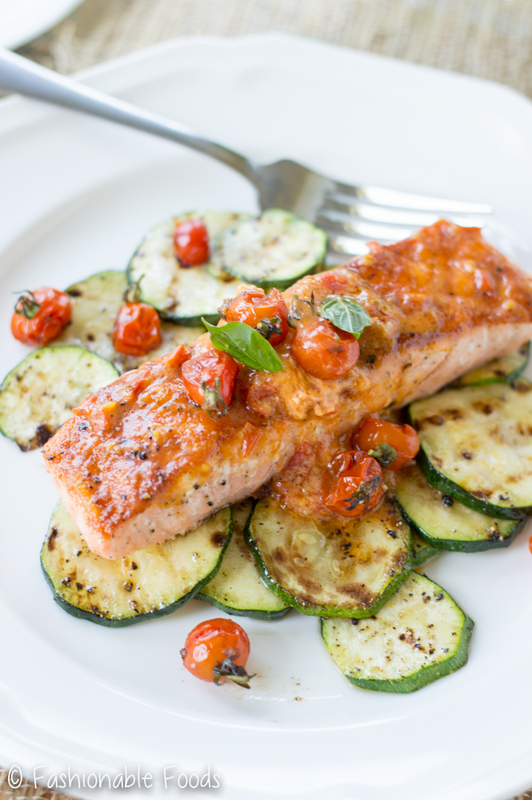 Grilled salmon with roasted tomato butter is the perfect way to enjoy the last of those vine-ripened cherry tomatoes. Happy Monday! 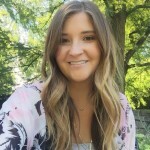 Yes, it’s a very happy Monday because I’m back to blogging. I took an unplanned, week-long hiatus because my husband broke his leg. Not only did he break his leg, but he was out of town when it happened. He ended up needing surgery, which meant I needed to travel to him and spend a few days there until he was cleared to get on a plane to come home. Craziness! All is ok for now and I’m trying my best to get back in the swing of things while caring for the hubs. 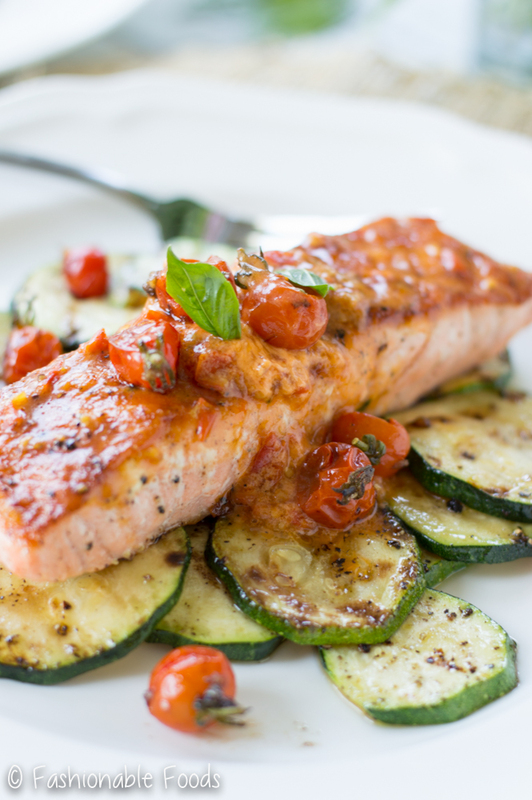 SO, let’s talk about this salmon with roasted tomato butter. You heard me right. Roasted tomato BUTTER. You may remember my roasted tomato pasta from a few weeks ago. If you haven’t tried that yet, run out to the grocery store ASAP and make it! Anyway, the roasted tomatoes from that is basically what makes up this roasted tomato butter. I’ve been obsessed with compound butters for months now. They are just so easy to make and add tons of flavor to simple meals – basically any grilled meat and vegetable can benefit from a pat of compound butter! 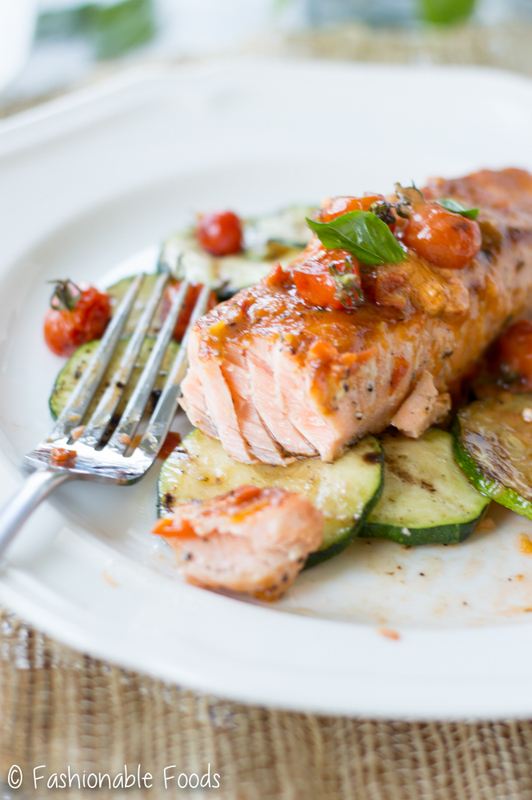 Salmon is my favorite protein – I’d eat it every single day and never get tired of it. 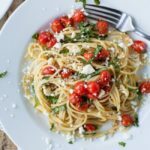 Topped with roasted tomato compound butter and I’d eat it for every meal! If salmon isn’t your thing, you can use this tomato butter a million other ways. Try it on any other grilled fish, shrimp, chicken, steak, or pork. 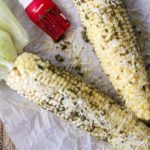 It’s also fantastic as a topper for grilled vegetables or tossed with pasta for an easy, but flavorful sauce! I like to call my meals this time of year “transition meals”. I’m not quite ready for fall food yet. One because I love summer and hate to let go of it, and two because it’s so dang hot. Seriously, who can even think of apples and pumpkins when it’s still in the 90s?! Although, I did buy a bunch of pumpkins the other day. But, it was in the 70s so it sorta felt like fall was coming. I felt justified to decorate for fall, order 6,000 fall-scented candles, and go hog wild buying mums and pumpkins at a local farm. However, when it comes to food I’m still clinging on to zucchini, tomatoes, and the last of the sweet corn. And peaches and watermelon. 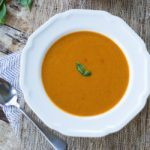 If you’re like me and still hanging on to all the summer produce, you definitely need to make this! Even if you are in full fall mode, I still think you should make this. It’s a great transition recipe for whatever state-of-mind you are in. You get freshness from the tomatoes, but the richness from the butter gives you the perfect amount of indulgence. I served this over grilled zucchini and some rice to soak up that tasty butter, but because of the versatility of the butter, you can serve it a multitude of ways. 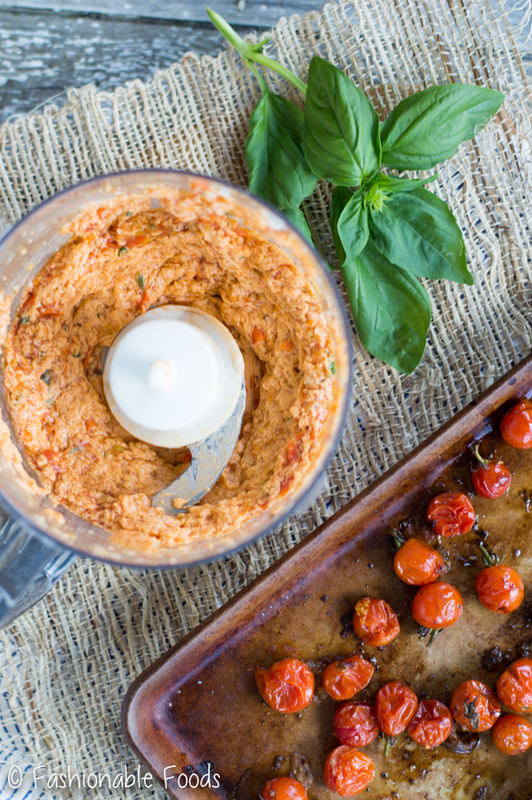 One taste of the roasted tomato butter and you’ll be putting it on everything! Combine the cherry tomatoes, garlic, balsamic, olive oil, salt, and pepper on a small baking sheet. Roast the tomatoes for 15 minutes, or until they are just starting to burst and look caramelized. Set aside to cool. Combine the cooled tomato mixture with the butter in a mini food processor and pulse until fairly smooth – you still want some texture. Transfer the butter to a piece of plastic wrap, form it into a cylinder, and wrap to seal it. Refrigerate the butter for 30 minutes. Preheat your outdoor grill (or a grill pan). Drizzle the salmon with a little olive oil and season well with salt and pepper. 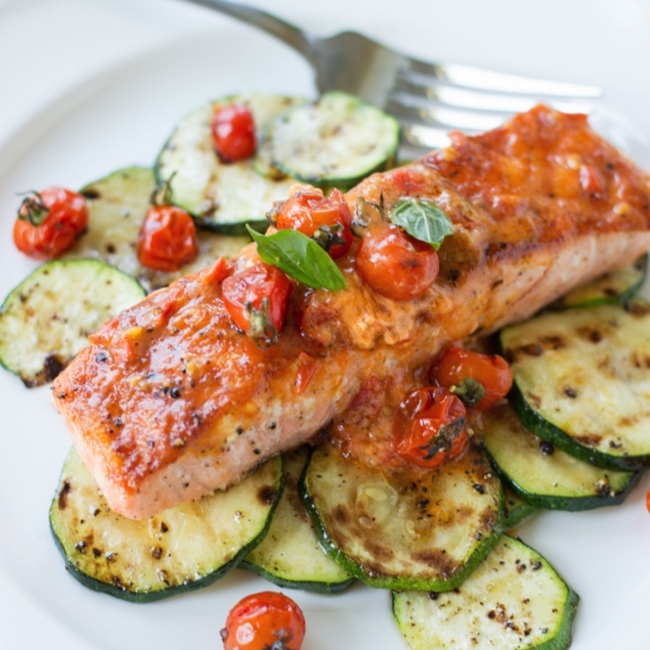 Cook the salmon on the grill for 3-4 minutes per side, or until the fish is to your desired doneness. Once you pull the salmon off the grill, immediately top it with a few pats of the tomato butter. Serve over grilled veggies and rice for a wonderful end of summer meal! Oh my gawsh, I’m so sorry to hear about your hubs!!! Breaking your leg is bad enough, but it happening out of town AND needing surgery? YIKES! I am sending all the feel better, heal quickly vibes his way! And good vibes to you while being a lil’ care taker. 😉 LOVE this salmon, Keri!!! Seriously, this looks incredible, and I could DRINK that roasted tomato butter! Hello dinner perfection! Cheers, girlie! Sorry to hear about your husband! That’s no fun, especially when he wasn’t even at home. Hope he feels better soon. I’m definitely hanging onto what’s left of summer with lots of salmon. Love this grilled version, Keri! Thanks, Gayle! It was a rough few days, but he’s getting there slowly!